Sign up for our new Gallery area! 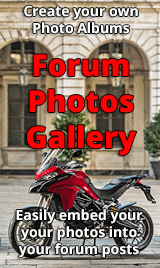 Create your own albums, upload your images, and post your photos on the forum. General chat relating to the Ducati Multistrada 950. Topics here should Multistrada 950 related on subjects that are not covered in other boards. Thinking about modifying your 950 or have you added some parts ? Discuss accessories and modifications you've made here. Chat about the maintenance and servicing of your MTS 950.
in Re: First Service Done! Discuss suspension set-up, queries, and mods in this board. Includes forks and rear shocks, headstock, swinging arm, general set-up and handling issues. Chat about general bike related topics that do not fit in the other categories. Also discuss other Ducati models here. If you have any probelms with the site or have any questions or feedback, post here. Link to Help and Support FAQ articles on various aspects of the forum. Want to know how to post a picture, or maybe it's your first time on a forum? Have a read of the articles here.